Along with the introduction of the TiVo Bolt came two highly publicized new features: QuickMode and SkipMode. QuickMode allows one to plow through recordings at 1.3x speed with minimal audio distortion, while SkipMode introduced TiVo’s take on commercial avoidance. Existing Roamio DVR owners were promised a QuickMode upgrade, but told SkipMode would remain out of reach. And we didn’t like it. As promised, TiVo has reevaluated that approach … and come to a favorable ruling. Based on a holiday promo and image assets hosted by TiVo.com, we now know SkipMode should begin hitting Roamio units December 10th. And one can safely assume the behavior will also extend to TiVo Mini extenders. Don’t miss your chance at big discounts on TiVo Roamio DVRs before they’re gone forever! For a limited time, we’re offering a year of free service when you purchase TiVo Roamio. Roamio DVRs will include innovative features, like SkipMode (in select markets*) and QuickMode, so you can jump past commercial breaks with a single click or watch recordings and shows with a buffer 30% faster with pitch-corrected audio. So act now and take advantage of this offer while supplies last. There aren’t many left! *SkipMode available in San Francisco/Bay Area and Chicago markets. As to the regional restrictions, I have no idea – since Bolt is available nationwide and not geographically limited. Perhaps it’s just a benign staggered rollout and the rest of us will similarly receive access in 2015. While not the ultimate in comskip, limited to select networks, select shows, and requiring manual intervention at each break, I’m still quite looking forward to this and hope to receive it soon. Should you share that sentiment, you’d be well served to get your name on the TiVo Priority List. QuickMode is also seemingly confirmed for next month. On the app side, I’m still expecting a refreshed Hulu Plus and new WWE app. Not sure if some underlying changes are required, like this update, before TiVo can flip the switch. Plus, I’ve been briefed on some cable-centric features we can soon expect – like tuning a SD channel suggests the HD alternative. As happy as I am to get SkipMode, it makes me question why I’d need to upgrade by Roamio to a Bolt before I get a 4k TV…especially with the change in fee structures. TiVo doesn’t need upgraders… they need lots and lots of new customers. Hopefully a OTA-only Bolt with more favorable pricing arrives to help them with that goal. They can mess with the logo all they want. But hidden behind it all, that’s the friendly TiVo mascot we’ve all grown to know and love. They tested our faith. And the believers were rewarded. TiVo doesn’t need upgraders… they need lots and lots of new customers. Hadn’t seen the reason previously. But now, done. It seems like TiVo is conceding that existing customers prefer lifetime service, but still pushing monthly service for new customers. Ok, so why did I buy a Bolt? Why would anyone now? The few remaining small features are surely not worth the $500 difference in all in pricing. Starting to feel more than a little misled by Tivo on the Bolt purchase. Perhaps the lifetime service option will become more reasonable so that the difference is not so great. There is just no justifying the huge gap. I’m loyal to TiVo, (and an evangelist), cuz they treat existing customers well. Some of us, the few, the proud, have been willing to spend the few extra dollars (with a decent grandfathered price) to not go lifetime, for the specific purpose of incentivizing TiVo to support older models properly. We died for your sins. Dave-any idea if rolling out the quick and skip mode functionality to premiere models is in the pipeline? I agree that it is helpful to keep existing customers happy, but at the same time, I wouldn’t have faulted TiVo for trying to keep some features Bolt specific even if they aren’t due to hardware limitations. Yesterday the official TiVo blog apparently misposted an entry saying that QuickMode was now available for the Roamio. The post was pulled, and the only reason I saw it was because it was around long enough for feedly to cache it from TiVo’s RSS feed. I was just ready to pull the trigger to buy a BOLT, but if skipmode is coming to my Roamio (w/PLS) I may sit tight. Honestly I’ve grown more accepting of the $149.99 annual fee on the BOLT for several reasons. One is the ongoing cheap replacement of the BOLT unit should it fail. Secondly I’m probably going to want to upgrade to new units when they come out anyway and being on an annual program means I won’t feel so locked in to my old unit. Lastly I’d like to see TiVo survive financially and an ongoing subscription model makes that more probable. While it would be nice if the fee was a little lower ($119/yr making it less that $10/month seems easier to justify), $12.50/month (based on annual) still isn’t too hateful for having TiVo on 3 TV’s in the house (1 Roamio & 2 minis). Just my opinion. I indeed hope the new features are coming to my Roamio! So quickmode and skipmode is going to be part of the priority list release? I’m glad I got my TSN’s registered. I have a Roamio that I purchased when they first came out. It does not have quick mode but I can push a button and skip ahead 30 seconds. When a commercial break comes up in the recording I just hit the button five or six times and I’m back to the show. I thought everyone’s box did this, so I’m a bit confused about the update. Gear LOL. That’s 30 second skip. Yes everyone has this. The feature that is being discussed is skip mode. Which completely eliminates commercials on some shows. I think it’s immensely helpful. Again, they face enough hurdles in getting folks to not accept the cableco default without having a highly loyal customer base, both for the obvious reasons, and also to reassure potential new converts. I would’ve faulted them. The TiVo bargain has always been that older models get the software improvements, if the technical / cost hurdles are easily surmountable. And even if I personally think the Bolt is shite, due to poor decisions in design tradeoffs, there are hardware incentives to upgrade for certain use-case-scenarios: namely 4K, (and the HEVC that goes along with that even for 1080), along with more responsive OTT apps. Jack, I assume 20.5.6 allows QuickMode and SkipMode. However, I also assume it has to be triggered on TiVo’s side based on the transient TiVo Mini QuickMode access I had. Honestly I’ve grown more accepting of the $149.99 annual fee on the BOLT for several reasons. […] I’d like to see TiVo survive financially and an ongoing subscription model makes that more probable. TiVo is a publicly traded, for-profit entity, not a worthy non-profit charity. They had up to $1b in cash that could have lowered customer monthly rates to grow their base (or invest in new ideas) but, instead, they’re buying back stock to reward their investors (not that it’s working). Having said that, while they don’t exactly mirror your altruistic nature, they’ve done a good job in supporting Premiere customers with the Haxe rewrite and updated apps, followed now by backporting the Bolt’s main updates to Roamio. Six of one, half a dozen of the other. They’re a worthy for-profit entity. We’ve all had struggling for-profit companies that we’ve heartily rooted for, especially when the only alternative is the Borg. You should’ve seen the crazy devotion to Apple back in the bad, old Gil Amelio days. And it wasn’t just the fanbois! 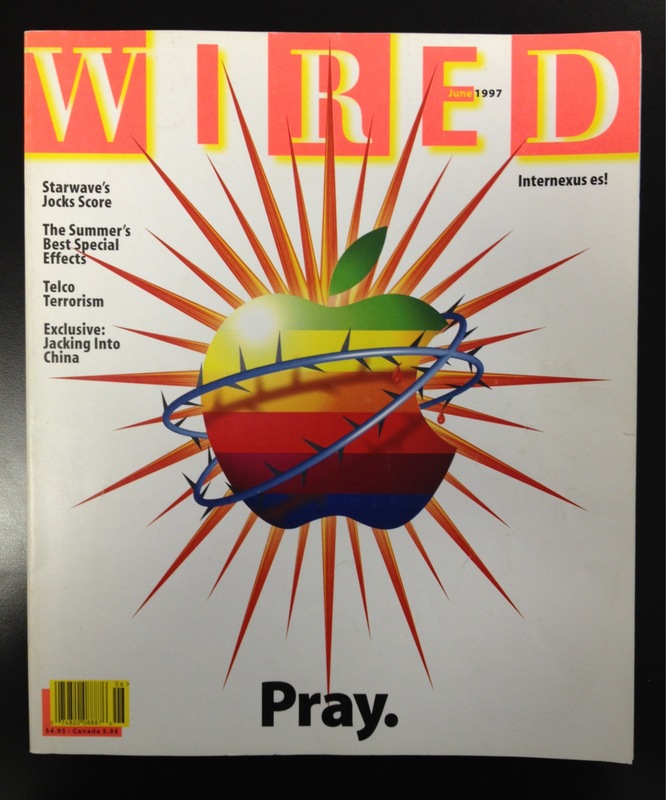 Remember the famous Wired magazine cover? I feel as though there had been insufficient commenting / displeasure with the TiVo-specified geographical limitations on Skip Mode for Roamio. Dave hypothesized that this could be because of a staggered deployment, but I currently have no reason to believe it’s coming to my neck of the woods in Michigan. Is there any more news on this? So, if the roamio has skipmode, will any mini’s attached to that roamio inherit it? Because my mini has quickmode even though my roamio doesn’t (yet). Makes me think that the features of the mini are independent of the features of the attached roamio. Ken, Engadget received a statement from TiVo calling this a test, not really adding clarity to the situation. It’s an unusual deployment strategy for them, but hopefully nothing more than that. dullgeek, that’s the prevailing theory. Unlike QuickMode, markers need to be added and read from the recording for SkipMode – so the dynamics may be slightly different. How does one activate skip mode and quick mode from the Roamio or Mini? I’m not sure if the Bolt has dedicated buttons for these features? Never mind. I clicked on the links in this article that took me to TiVo.com. They had good explanations. I recognize TiVo isn’t a charity but it’s in all of our best interests for them to be profitable in order to survive long term. I realize they have lots of operating cash from litigation but they still need to have an ongoing business model allows them to remain in the black. As a cord cutter I’m very sensitive to monthly or ongoing fees. But I am willing to weigh the value I receive from services such as TiVo and decide if the benefit received is worth the cost. For me the $149.99 annual fee is worth it for the benefits I receive from TiVo even though I still prefer a reasonably priced “all in” option. Dave, love your column! That’s not how it works, Dave. The code for the priority update is delivered by drone, directly to your TiVo. So Alviso can only drone it to you if the FAA has already approved your location. And indeed it is. I forced my Roamio to do a TiVo service network connection, explicitly requested it to reboot, and it now supports QuickMode and has channel logos in the guide. I’m not seeing any HD channel notifications though, and the D button on my remote doesn’t do anything for me when tuned to SD channels. Does that maybe work only for certain channels or certain cable line-ups right now? So, Dave, are you now willing to eat crow for your 100% incorrect assertion upthread that TiVo wasn’t a charitable “non-profit”? I mean, seriously, (not seriously). It’s set up like exactly like a well-functioning charitable non-profit. The “foundation trust” – aka the patent trolling – funds the “charitable non-profit activities” – aka the DVR business. @james, repeat guided setup and the HD Channel notifications will start showing up. I got Quick Mode on my Roamio Plus today, but no skip mode. My Roamio and Mini now both have the same feature set, including the icons on Guide. I’m running 20.5.6.RC14. I signed up for the priority list, which explains the RC designation, but not sure how close to release this is… Hopefully the full version will have Skip Mode included. I am somewhat disappointed with the look of the text, as it is very grainy and choppy looking compared to the prior releases, but I am hopeful this is the release candidate software not being quite as complete as the full release will be, though I’m not optimistic. After reading through TivoMargaret’s posts on TivoCommunity, I guess this isn’t a release candidate, but the full release. I’m not happy with the font changes, but I guess I can get used to them. The lack of Skip Mode is due to my proximity to one of the 2 metro areas currently supported (seemingly arbitrarily, but not sure), San Francisco or Chicago. Hopefully they will expand that quickly. @Sam Repeating guided setup worked. Thanks! Kind of lame that I had to do that though (and now I have to re-disable all of the channels I don’t receive). Just a little bit of tidbit of inside info on the Roamio’s and Skipmode……. So as you see, only two markets will receive the Skipmode on the Roamio DVR’s. Other markets will receive it at a later date. So it may takes months for our Roamios to receive this update if you are not in those two markets. SkipMode got enabled on my Roamio Plus. I have to say, I find the SkipMode chime very annoying. It wouldn’t be so bad if it played once when transitioning from show to commercial during normal playback, but it plays constantly when skipping over individual commercials with 30-second-scan or if I hit the replay button when the show resumes and hit the tail end of the last commercial. Also, as a fan of 30-second-scan, I wish I could make SkipMode scan through commercials instead of skipping them all instantly. Maybe I’m weird. I have been using SkipMode for my Minis and Roamio Pro for the past week and it is GREAT! I like that they enabled the “channel up” button to do the skip (along with the “D” button) as it is easier to find the “channel up” button. I also like that it retroactively made all of the shows on my tivo (for the particular channels it works with) all have SkipMode in the episode as I have to catch up on a lot of shows. QuickMode is also a lot better than I thought. It works good with hockey and other sports, but I thought it might be weird for normal tv shows. I have watched Elementary, CSI Cyber, NCIS LA, and Survivor in QuickMode in the past week late at night trying to squeeze it in before bed and have been pleasantly surprised with how I do not mind it. I will continue to use this when I have limited time. It works really well with my Roamio. I’m in Sunnyvale, CA.